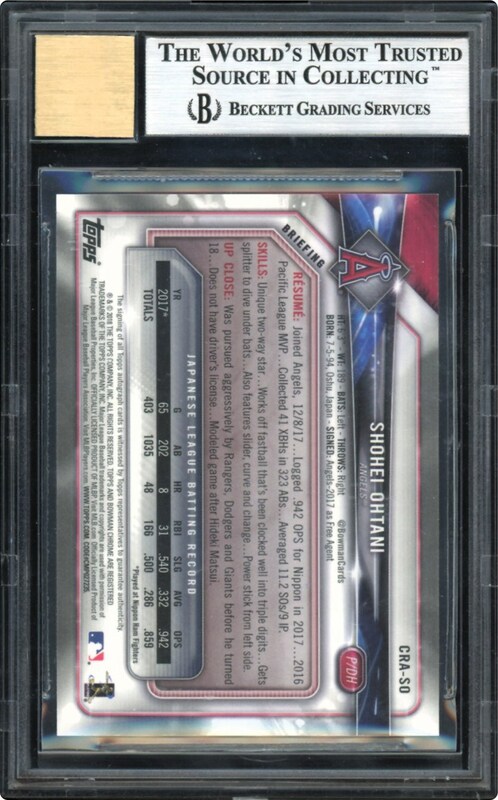 OHTANI AUTO ROOKIE!!! Shohei Ohtani made the 25-man roster and started as the designated hitter on Opening Day against the Oakland Athletics and got a single his first time at the plate. On April 1st he made his pitching debut, striking out six batters in six innings while allowing three runs, to pick up his first MLB win. On April 3, Ohtani hit his first MLB home run, a 397-foot three-run homer against Josh Tomlin. The following day, he hit his second, becoming the first Angels player to homer in his first two career home games. He tied the franchise record of 12 total bases, and five RBI through his first three consecutive career games. On April 6, he hit his third home run in three days, becoming the first Angels rookie to do so. In only his second start on the mound on April 8, Ohtani took a perfect game through 61/3 innings before allowing a hit. Overall, Ohtani pitched seven scoreless innings while striking out 12. His short career in MLB has pushed his Rookie Autographed cards thru the roof. His better ones are skyrocketing daily including the offered example in this lot. 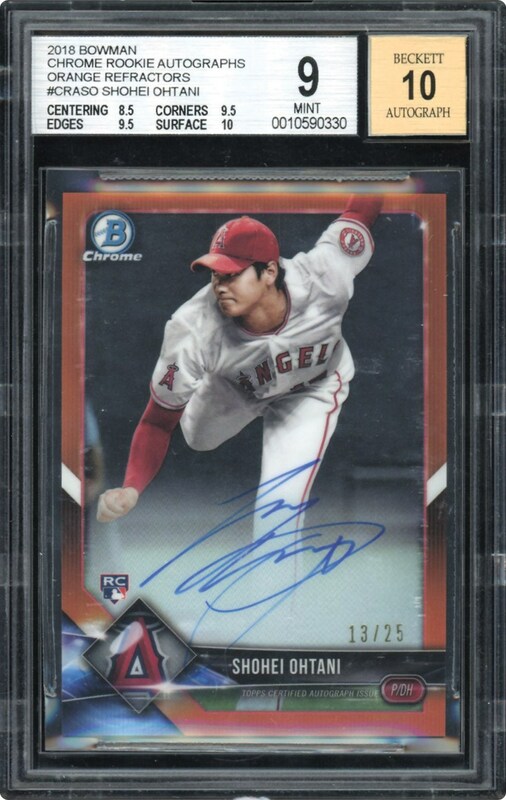 This 2018 Bowman Chrome Rookie Auto Numbered Orange Refractor has been graded 9 MINT by BGS with the following Subgrades: Surface 10, Edges & Corners 9.5 with an 8.5 Centering. The card is also numbered on the front #13/25 with a Bold Auto on the front of this Orange Refractor. The Auto grade is a spectacular 10 GEM MINT grade. One of Ohtanis most sought after cards, this card is one to own.